The WILD Center has three raingardens that catch rainwater coming of the slope as well as from rain gutters preventing it from flowing directly into Little Lake Butte des Morts. The long roots of the native plants help filter the water as it percolates into the water aquifer below. A raingarden is a basin created to temporarily hold water from runoff from roofs and sloped and paved areas. In the basin are planted native forbs and grasses which can tolerate wet roots for a short period of time. 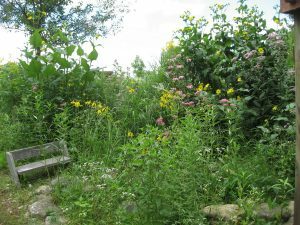 Such plants might be Cardinal Flower (Lobelia cardinalis), Culver’s Root (Veronicastrum virginicum), Mountain Mint (Pycnanthemum virginianum), Swamp Milkweed (Asclepias incarnata), Prairie Cordgrass (Spartina pectinata) and a variety of sedges or carex. 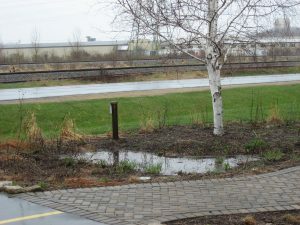 A bioswale is a waterway designed to slow the flow of water from raingutters and downspouts, culverts and sloped areas. It can be vegetated or stone-lined and would lead to a garden or pond, typically. Here you would use the same plants as mentioned under raingardens. Added to the list could be Blue Flag Iris (Iris versicolor), Ironweed (Veronia spp), Sneezeweed (Helenium autumnale) and Blue Flag. Volunteers building bioswale at SE corner of WILD Center. Rainwater flows from downspout at SW corner of garage underground to French drain which gathers water from sunroom. From there, the water flows down the bioswale into a small pond. Bioswale at SE corner of WILD Center. Note small pond bordered by stones at the lower left. Excess water from the pond flows underground to the garden beyond. Spring rain flows into the WILD Center’s entrance raingarden. Water flows underground from raingutters and the H2O pavers which make up the brick path. Permeable pavers are paving products that allow rain water to soak in rather than run off like impervious products do. Permeable paving includes pervious concrete and porous asphalt, and open-grid and H2O pavers, and is most often used for parking areas, patios and pathways. See WILD Center Entryway. Not just for any home, green roofs require a structure built in anticipation of the installation of a green roof. It slows down, captures and reduces the amount of rainwater that falls on the roof of a building before it reaches the raingutter. Native sedum called Stonecrop (Sedum ternatum) is typically used for the plant species, but short grass prairie species can be used quite successfully as well. 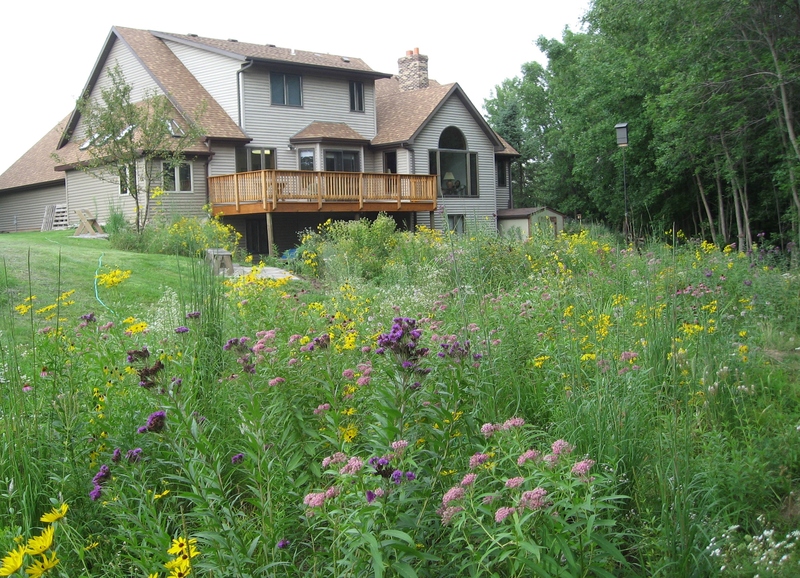 Forbs and grasses need to be able to tolerate high heat and dry conditions such as Little Bluestem (Schizachyrium scoparium), Nodding Pink Onion (Allium cernuum), Purple Prairie Clover (Dalea purpurea), Wild Petunia (Ruellia humilis), Prairie Smoke (Geum triflorum), Butterflyweed (Asclepias tuberosa) and Showy Milkweed (Asclepias speciosa). An added benefit is the reduced energy used for both heating and cooling because of the added insulation of the roof. 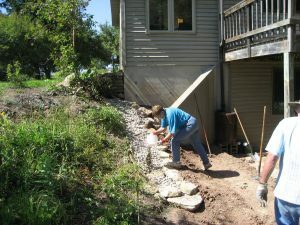 Regardless what you choose to help manage stormwater, it should be an integral part of your landscaping. It should beautify your yard, enhance wildlife habitat and save the work of caring for an area of soggy lawn. For more information about rainscaping, go to the Missouri Botanical Garden’s Rainscaping Guide. 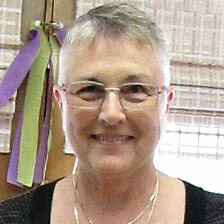 Thanks, Toni Stahl, for sharing the original idea for this post with me in your Nature Scoop newsletter.